What a recovery by Lewis. Lucky he's light and fit & can breakdance himself back into the seat. Would have loved to see him finish the race but alas, Bonsu was retired. therealkramer, Gilgamesh likes this post. ^^Brilliant, great understanding between driver and horse...frame by frame composure of both. She's a showoff that girl..right on herself haha..'cmon Mr. Lewis I'm waiting' , final frame away and pacing with the unique neat style of hers, head up and proud as punch, busted tyre and all! She hasn't got much of a motor but plenty of heart which is a motor within itself. As soon as she got pacing again..the head went back down and it was all business. If ever a horse enjoys it immensely out on the track it's her. Her debut run was Saturday 5th March 2011 Gloucester Park . Driver Colin Brown. 4th placing. Winner Money Never Sleeps. First win Monday December 17th 2012. Pinjarra. Driver - Chris Lewis. Both of them did well to stay in. Look at the guy in the red, he's hanging out too. I found barrier and win information on the Tracks page on harness.org.au and put them into a chart to compare track to track. Not much to say on it at this stage, but interesting to see Golden Mile's most winningest barrier is 6 followed by 9, Wagin's is 4 followed by 10. Could it be due to PBD? Guess I'll never know. I hear your argument on leaders bias at GP Marko....a product of lots of things, PBD amongst them and if the best horse leads, then yes, a screaming leaders track, like most tracks when the best horse leads. Race 1 Aussie Delight....came from 4th (1x1) to beat Khun Ratha and Livura who both came from way back in the field. Leader got beat. Race 2 Skippy Rascal ...came from 1x1 to beat leader simba Bromac with Wrappers Delight coming from way back. Leader got beat. Race 4 Ideal Alice from 5th at the bell (3 back the pegs) beats the breeze horse Almaretto with Quite a Delight 3rd from way back. Leader (and a good leader in Eden Franco) got beat. Race 5 Courage Tells ...from 4 back the pegs at the bell...leader got beat. Race 6 Well yes, Lazarus wins from leaders back horse Chicago and leader Tiger Tara but they were the best 3 in the race and the way the draw panned out, that was the expected result. Race 7 Ultimate Machete..as above the draw said he will win, way too classy. Race 8 The Bucket List works around 3 wide, leader gets beat, Major Dan 3rd from way back. Race 9 Mista Shark circles around them 3 wide. Leader got beat. Race 10 Trotters race...say no more, they are a raffle on a good night. Race 11 Costa del Magnifico ...around them 3 wide...leader got beat. Not at all wishing to start an argument but was hardly a screaming leaders track last Friday, that's all. Does anyone have any suggestions on where we can advertise for stablehands/track work staff, or know of anyone looking for a job? I've tried the job board on harness.org.au, Twitter, messaged the South Regional TAFE, put it on the WA Harness Trader and Australia Harness trader Facebook groups plus a couple other job sites.. not sure where else would work. Job is based in Busselton, pays well, we've got no shortage of high quality horses plus because we only train ones we own, there's no issues with job security. Ai ai ai ai ai. Why is it so hard to find people. These numbers reflect the flat out advantage that inside horses have in the RBD's at GP. Drawn 3 to 9 and 90% are only looking to run a place from the start .... hoping someone is going to have a brain fade and attack the leader unmercifully to give them any chance of winning by turning the race upside down to contemplate with their QDT. There are too many horses on the track for it to be anything approaching even contests and the PBD conditions do nothing to alleviate this. Races such as M0-2 RBD & MO $14990heat/ $25000 final RBD races are very ordinary handicapping events. The best horses/tightest assessed horses often draw inside lesser assessed horses and start odds on from better draws. Even more ridiculous have been MO heat / final series where the heats are pref draw on C Class and the final RBD ie a C15 can draw inside a C1 in the final. Mind boggling. but why are C1's entering for M0 races? When I was a kid, you generally wouldn't enter for GP on a Friday unless you'd won 4 country races from memory. Yep, old "qualifying stakes" was for 2.25 or better which equates to C3....agree the RBD of The San Simeon Final makes for a potential no contest. Well then really, that's the trainer's fault - not the handicappers. Every 10 starts without success you drop a class......if you are a C10 and race 90 times without winning you will become a C1. The secret is in the understanding of the word "handicapper"......in the races I mentioned and others not mentioned the office responsible applies conditions that can "advantage" better class horses to the detriment of lesser assessed horses. That is not what handicappers should aspire to do. I have never seen that in WA... can you find a field in WA where that's the case? I'm really curious now! The mixing of claimers into graded races is also more prevalent in NSW. There are a number of runners in races at Pinjarra today that have dropped back multiple classes over time due to lack of victory in races. eg race 5 Barkers Hall for instance is a 14 race winning C2. Lisdelight is a 6 race winning C1 Ergo is a 9 race winning C1 Ronan Maguire an 11 race winning C2 etc etc. The drop back rule is a national application Marko. It was meant as an incentive to keep older horses who were no longer competitive at their assessment racing rather than being turned out or otherwise. To keep field sizes at an optimum size it has been somewhat successful but due to the nature of the durable old standardbred younger horses have to compete against some pretty decent older horses that have dropped back so it is a double edged sword. Melton a 1st class track? Only behind Menangle as the most boring main track in Australia for mine. Give me GP every day of the week! Globe Derby 17kms from Adelaide CBD. Melton 50kms from Melbourne CBD , no public transport in the evening. Menangle just a lazy 70kms from the Sydney CBD, hitchhiking only. the perfect example with a family that have harness involvement on a daily basis for 45years I no of,would not surprise me if its over fifty years .....total dedication and love for the standardbred ..
the family breed the horse they full well no his capabilities as a 9 year old and they would thoroughly enjoy getting up to work him....would like to no over the journey how many winners w.t.groves has trained over 400? 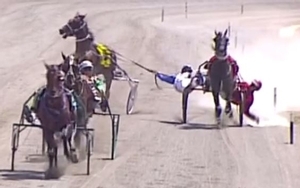 good card of country harness tonight.. Yes STG, Alta Christiano or Beaudienne couldn't start ....but they could front up in the C2 after having won the Derby......and the R race for $3500, win and you get $1755 after percentages.....after travel, a coffee and a burger for the family and your lucky to clear $1500 ......hardly a huge incentive. It is a good old fashioned country meet.....but aside from a few keen connections and family, it won't be busy in the dining room. Hope I'm wrong....and hope after traveling over, that the forecast "possible storm" doesn't eventuate. Narrogin is in the Bermuda triangle of harness racing.......more meetings have been lost without trace there in "possible storms" than anywhere on the globe. Poor buggers seem to cop it regularly.